Your organization has just made the decision and completed the purchase of your bus. Now, you have to think about protecting your bus investment. Depending on the region you are in, will determine how much protection and what type of protection your new bus will need. If you live in northern states, salt on the roads and the harsh cold winters can be very formidable to deal with. Likewise, if your organization is in a coastal town, the salt from the ocean can also be an issue. This article will address two ways that will help you in protecting your bus investment: carport storage and rust protection. In all different climates, the sun and rain will beat down on your new bus. By purchasing a metal carport for your bus, you are taking a HUGE step in protecting your bus. 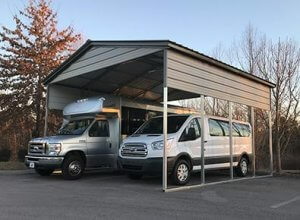 While there are many sizes, shapes and colors to choose from, a simple carport cover for your bus will be much better than your bus sitting out in the elements all year long. When shopping for a metal carport, you will first need to know the dimensions (length + width + height) of your new bus. This will determine the size of carport structure you will need to purchase. Most carport manufacturers make three basic versions of their carports: basic, better, and best. The names for these three styles can vary from manufacturer to manufacturer, but the construction is very similar. For example, the carport shown above is one that a church in Middle Tennessee purchased from Spring Hill Sheds for their two vehicles. This particular structure is called a “Vertical” building. It would fit in the “best” category. The vertical style carport means that the roof panels run down vertically from the roof. The “basic” version (also known as a “regular” style) as well as the “better” version (also known as a “boxed eave” style) have panels that run horizontally. With the regular and boxed eave, the rain, snow, and leaves would have to travel over ridges down towards the edges of the building, which is not ideal. Whichever style you choose will still be better than no covering at all. As mentioned above, many northern states apply salt to their roads during snowy and icy conditions. This is essential for public safety during inclement weather. While salt and/or brine may be essential to keeping the roads safe, it also poses a danger to metal as it causes rust and corrosion. The way to protect your bus from salt, brine or other chemicals that are on the road is to get some sort of undercarriage treatment to your new bus. There are many companies who offer undercarriage protection on vehicles such as Ziebart. The absolute best time to purchase rust protection for your new bus is as soon as you buy it. It is best not to wait for too long to have this protection sprayed on your vehicle. Rust protection is more needed in areas such as northern states and coastal towns than other areas and climates like Arizona, New Mexico and Nevada. Those states are neither coastal and don’t get so cold that they have to deal with salty roads. Unfortunately, adding rust protection to a used vehicle can be pointless if the damage is already begun on the vehicle. Rust protection is best used on new buses. Protecting your bus investment is the worth the cost. 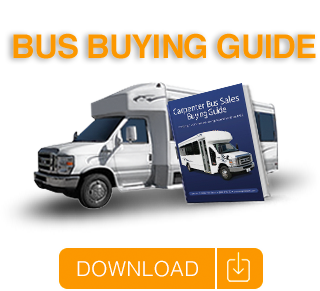 Your bus purchase is likely one of the largest capital investments your organization will make. Adding a carport and rust protection are very minimal compared to what you paid for your new vehicle. As the old adage goes…an ounce of protection is worth a pound of cure. The same is true for protecting your new bus!